A picklist is a document which shows the items that need to be picked from the warehouse to fulfill sales orders. With Orderhive, you can seamlessly print picklist with just a few clicks. Note : It is important to have "popup blocker" for " app.orderhive.com " allowed. Picklist will not be downloaded if popup blocker is disable for Orderhive software. Go to sales order listing page. Select the orders via the checkboxes and click on the Print button. Select Picklist. 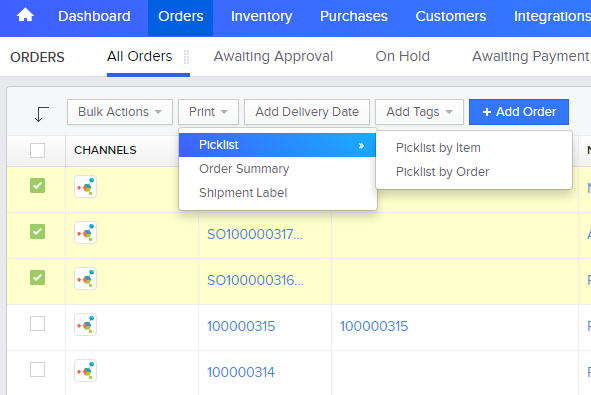 Orderhive offers two types of Picklist; by item and by order. Picklist by Order: This document will display the order details such as Order ID, Bill to and Ship address along with the product and warehouse details. Picklist by Item: This document will display only the product and warehouse details for the selected orders. Note: You can only print picklist for orders that are confirmed.